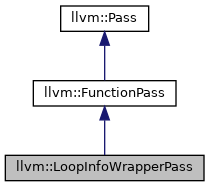 The legacy pass manager's analysis pass to compute loop information. Definition at line 974 of file LoopInfo.h. Definition at line 980 of file LoopInfo.h. Definition at line 823 of file LoopInfo.cpp. Definition at line 984 of file LoopInfo.h. Definition at line 985 of file LoopInfo.h. Definition at line 828 of file LoopInfo.cpp. Definition at line 992 of file LoopInfo.h. 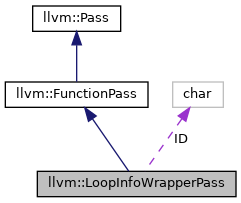 References Context, llvm::findOptionMDForLoop(), llvm::findOptionMDForLoopID(), llvm::isValidAsAccessGroup(), llvm::makePostTransformationMetadata(), Name, llvm::RISCVFenceField::O, llvm::LoopBase< BlockT, LoopT >::print(), llvm::printLoop(), and llvm::LoopInfoBase< BlockT, LoopT >::releaseMemory(). Calculate the natural loop information for a given function. Definition at line 805 of file LoopInfo.cpp. Definition at line 811 of file LoopInfo.cpp. Definition at line 978 of file LoopInfo.h.